The Gala is back on Mission Bay! Join us on Friday, June 21 to celebrate the incredible work our volunteers, staff, members and supporters are doing to protect San Diego County's 72 miles of coastline. June 21 is the Summer Solstice - what better way to kick off Summer 2019 than by celebrating with YOUR San Diego County Surfrider Chapter! Your ticket purchase includes entry, buffet dinner, 2 drink tickets, and entertainment. You'll also have exclusive access to over 75 art & non-art items up for bid in our silent auction - 100% of the proceeds support our chapter's programs! $75 early bird tickets available now! Price will go up by $10 on April 21, 2019. Needless to say, 100% of profits go directly to our Chapter's efforts to protect San Diego County's ocean, waves and beaches. We can't wait to spend the first day of Summer with you! 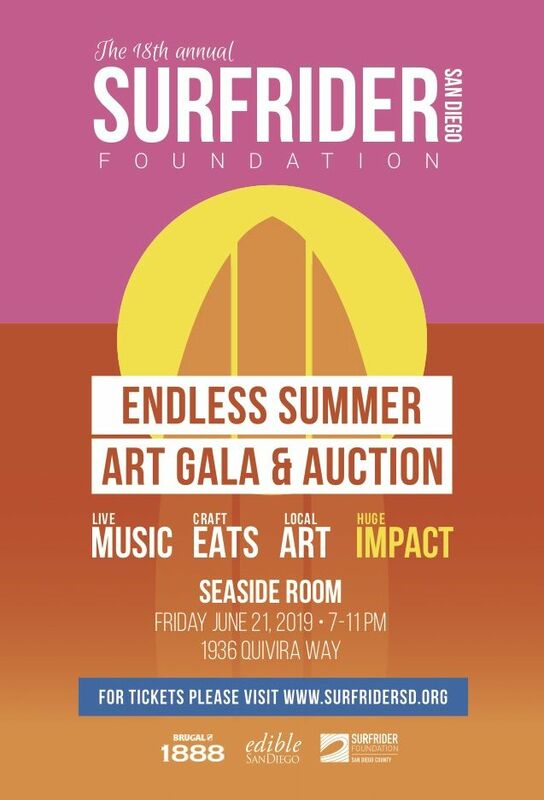 If you would like to donate art or a non-art item, service or experience for our silent auction, please email our Procurement Lead, Sunshine Johnson, at sunshine@surfridersd.org. Interesting in sponsoring our event as a corporate sponsor or individual underwriter? Please click here to see our 2019 Sponsorship Packet. Purchase your tickets early and save $10! Price goes up to $85/ticket on April 21, 2019. Includes entry, dinner and 2 drink tickets! Surfrider Foundation San Diego County has partnered with Give Lively to securely process your online donation. This transaction will appear on your credit card statement as "Surfrider Foundation San Diego County". This transaction is subject to Give Lively's Terms and Privacy.